I was invited to appear on the new Pawn and Pint podcast series Board at Work. Pawn and Pint is a game pub in downtown Kansas City, Missouri. They have a gigantic wall of board games and many RPG events. Board at Work by Pawn and Pint: EP 003 Talking Star Wars with writer and game designer Sterling Hershey - Donald the DM and I discuss the span of my career as a writer and game designer for the Star Wars role-playing games. And some other bits. Last week Jason Fry and Shannon Shark invited me on their Mets and Star Wars podcast called I'd Just as Soon Kiss a Mookiee, just before the Royals-Mets opening day. We talk baseball, stadiums, Royals, Mets, the Star Wars RPGs, Rebels and more. It was a lot of fun. Jason is a Star Wars writer (Atlas, The Weapon of a Jedi, and many more) and blogs about the Mets at FaithandFearInFlusing.com. Shannon Shark blogs about the Mets at MetsPolice.com. Since recording the podcast, the Royals defeated the Mets in opener. Jason's blog recap entry is here. John 'Dak' Morton interviewed me recently about working on the Star Wars RPGs over the years, and it was posted to starwars.com tonight. John is, of course, the actor who played Luke's snowspeeder gunner 'Dak' The Empire Strikes Back. I met him at Star Wars Celebration Anaheim earlier this year. Star Wars Celebration. Too much to be confined to one day, and too much to be confined to one blog post. While I was busy getting ready for GenCon, the Threat Detected podcast posted Part 2 of their interview with me. This one focuses on Dawn of Defiance specifics. You can find it here. The interview starts at about the 40:50 mark. Recently, I was a guest on the actual-play Star Wars Saga Edition podcast Threat Detected. They're running through the entire Dawn of Defiance campaign, recording the sessions and posting them. They also post pictures of their sessions to their website, mainly of the map and terrain layouts during play. Part 1 of the interview runs in Episode 9, from the 1hr 29m to the 1 hr 53m mark. We discuss Star Wars and a bit of D&D 4e. This week, I was a guest on The Tome Show podcast, talking about Nentir Vale along with two of my co-authors, Brian R. James and Matt James. You can find it here. I was a guest on the Order 66 podcast last night, and it's now available online. GM Dave, GM Chris, Chris Bradshaw and I talk about our experiences at GenCon and Star Wars Celebration V.
Minis Mayham 42 - Life, the Universe, and Scenarios! Last week, I was a guest on Minis Mayham #42 podcast, where we discussed 8 scenarios entered into their first scenario contest, and they announced the winner. With one exception, I played through all of the scenarios multiple times. They were very creative and fun. On the podcast we discuss their strengths and weaknesses, presentation and balance. Good stuff for scenario designers to consider. At some point, I think they will post the scenarios to their forums. Each used Christopher West's excellent Maps of Mastery maps, available at his website. This was the first time I'd used Chris' maps in play, and they are equal to his official Star Wars minis maps. For those who don't know, Chris was the artist on all except one of the official maps over the years. His Maps of Mastery releases are just as easy to use, but lack any official Star Wars images. They're good for both minis and any sci-fi RPG. Earlier this week, I joined the cast of Order 66 along with fellow authors Rodney Thompson and Jonathan Stevens, discussing The Unknown Regions. Received a lot of praise for the feats and talents, which was a bit unexpected given that I'd been too busy to follow the forums at WotC and elsewhere lately. I'll try to check in later on. I'm glad we've had such a positive response to the book. You can download and/or listen to the podcast here. Today, Starwars.com posted an article/ interview on The Unknown Regions with myself, Daniel Wallace and Rodney Thompson. 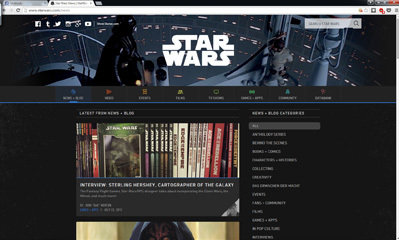 At the moment, it also has a link on the main starwars.com page, though that page cycles often. Tonight I was a guest on the Order 66 podcast, Episode 101, where we discussed creating non-player characters from story and mechanical perspectives, as well as the limits or fun of using accents. You can find links to my previous apperances on the show here. Minis Mayham, a podcast on the Star Wars Miniatures game, just posted their 1 year anniversary episode. Joining the regular hosts are myself, Gary Sarli (Star Wars Saga Edition editor and Jedi Counselor) and Christopher West (cartographer for nearly all of the Star Wars Minis maps). We discuss the end of the Minis and RPG game lines, our past work on the game and our current endeavors. You can find the episode at the link below. You can find my past interviews by clicking on Interviews in the menu bar above. Now I know I've been busy, having overlooked posting this here. A couple of weeks ago, I was quoted on the starwars.com site in an article on the Scavenger's Guide to Droids. You can find it here.